Tillandsia cacticola, growing in its native habitat in northern Peru at an elevation of 1800 meters. 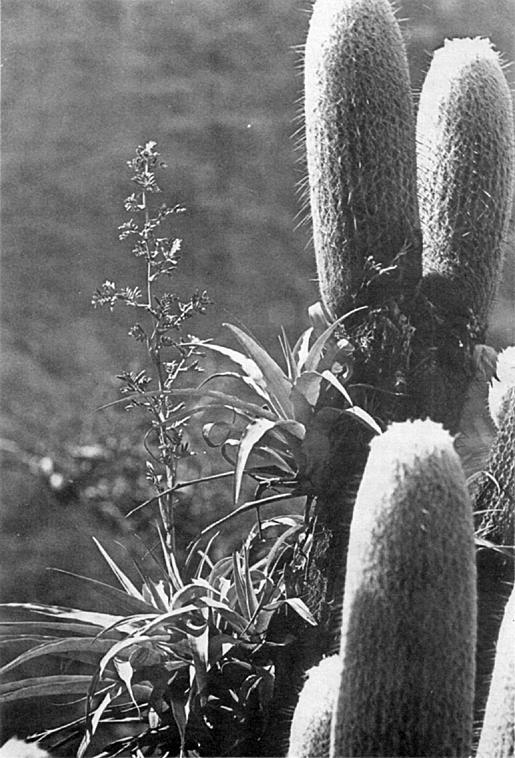 Photograph by Prof. Dr. W. Rauh taken on his most recent bromeliad collecting expedition in 1967. Articles and photographs are earnestly solicited by the editor. Length is no factor. Please mail all copy to the editor, 647 South Saltair Avenue, Los Angeles, California 90049. Some flower enthusiasts, when they see a new and handsome plant in bloom for the first time, exclaim that it is the most beautiful specimen they have ever seen. Praise of this sort, however, is an emotional reaction and may not mean much in the long run. But I can proclaim with conviction that Tillandsia cacticola is one of my most cherished favorites. It took a great effort to get a specimen going, but all past trouble is being amply repaid by the joy I get from watching the plant's rapid growth and ready bloom now that it is established and thriving on a minimum of attention. I first met Tillandsia cacticola in the garden of M. Julian Marnier-Lapostolle known as "Les Cedres." The flowers on Monsieur's specimen had long withered, but the spike still fascinated me. In 1963 I received a few plants from a collector in Peru, but they arrived dead, and it looked as if my hopes to own this treasure had to be buried the minute they seemed to materialize. Giving the sorry Peruvian lot a last sad glance, I was ready to turn away when I glimpsed a bulging pod on one of the dead plants. I fastened the seed from the pod on fir-twigs according to my foolproof method (outlined in Bulletin, 1966, No. 1) and was delighted when germination proceeded nearly 100 percent. I had divided the seeds into several sets and gave each a different treatment. It was gratifying to learn that the seedlings which had received more elaborate care, including frequent dips in a much-diluted fertilizer, were far ahead of the rest. They were growing the year round, a thing not every Tillandsia species will do. In the spring of 1948, only 4½ years later, the strongest of the seedlings prepared to bloom. The seeds that did not get the extra care were at that time more than half way behind; it may take another two or three years before they can flower. 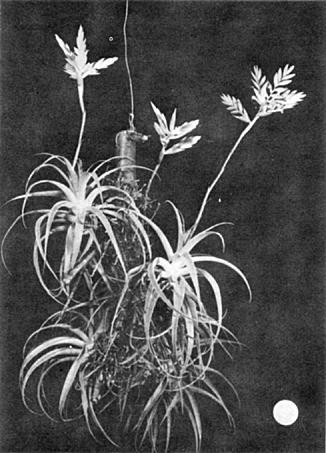 Tillandsia cacticola is a rosette of whitish leaves. In older plants the leaves are quite broad at the base and taper to a fine lancet-like point. They may reach a length of 30 to 40 cm. The plant likes lots of sunshine. When the air is very dry, the leaves roll up sideways forming almost a tube. It helps to reduce evaporation. Oncoming moisture will unroll the blades and restore their original canal shape. The plant undergoes a rest period, either in midsummer or during the winter. It needs to store nourishment for the growth period ahead. The flower spikes appearing in spring or in autumn have astonishing vigor and size. It is a miracle how they can produce such extraordinary growth. The flowers mature within a month or two depending on surroundings and general conditions. The spike is another marvel. Its outstanding features are 5 to 6 ear-like spikelets branching out from the tip of the 40 to 60 cm high stalk and the fan-shaped bracts which are white with a lavender-pinkish sheen. They remind one of the shimmering mother-of-pearl look on the wings of certain butterflies. Both tones are caused by refraction, depend on light incidence, and are difficult to trap with the camera. The bracts are the gems of Tillandsia cacticola. They catch the eye even before the actual flowers open. Corollas are rounded, 5-6 mm in diameter, ivory color with a thin blue margin. The long-lasting flowers open one at a time; one or two months may go by before the last ones fade away on the tips of the fan. But even then the bracts stay ornamental. Hand pollination is easy, but I got results only when I cross-pollinated with different plants. The long life of the flower spike and the length of the stalk recommend T. cacticola as a cut-flower. Such may be its use in the homeland, since one Peruvian supplier mailed a parcel containing only flower spikes when he got an order for this Tillandsia from Europe. The name cacticola, meaning "growing on cactus," tells of the plant's natural habitat. In Walter Richter's book on bromeliads (first edition P. 356) the printer misspelled the name, wrote "cacheola" instead. Of course, our Tillandsia can live without the cactus. Nonetheless a cactus-fan may like to try it on a columnar cactus. No doubt the Tillandsia's strong roots will find a ready hold in the mass of spines that garnish a Cereus. The valuable attributes of T. cacticola suggest the possibility of making it an addition to the commercial grower's line of T. lindenii, now the mainstay of the group in Europe. 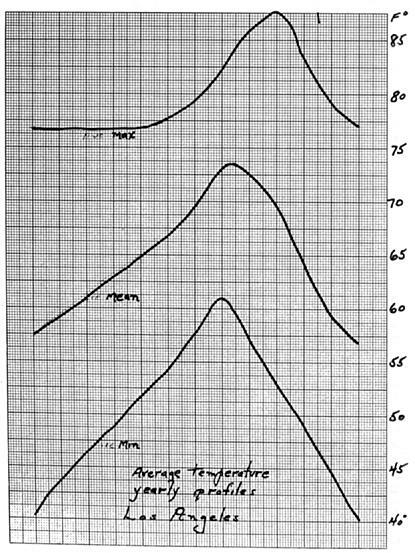 My experience is that T. cacticola is not too particular about air humidity and temperature. In summer it can stay outdoors even in our latitudes. Well-established specimens often produce new shoots while the mother plant still is in bloom. The pups flower the following year. A number of varieties have been listed under the species. A near relative is T. purpurea. As the name implies, it is a more colorful plant, but its bracts are much smaller and it cannot vie with the impressive beauty of T. cacticola. Early this year, the Bromeliad Society lost two of its most respected members — James N. Giridlian, pioneer bulb and rare plant grower of Arcadia, California, and Charles G. Hodgson, of Melbourne, Australia, and once actively associated with the Adelaide Botanic Gardens. Mr. Giridlian — known affectionately as Jimmy to his many friends — had been active in the Society as a member of the Board of Directors from 1958 and had served as President from 1963 to 1965. He was one of the first to grow bromeliads in any quantity in Southern California and had a profound interest in them, especially Billbergias, of which he made a number of fine hybrids. His nursery, Oakhurst Gardens, was a mecca for all plant lovers, for it was not only beautifully situated among a number of venerable old oaks, but it offered the choicest in bulbous materials, orchids, bromeliads, and other rarities. His catalogue was always filled with unusual listings that could be purchased nowhere else in this country. Endowed with a genial personality as well as a deep love for all growing things, Jimmy delighted in having visitors so that he could just talk about his plants. He was never too busy to be of help to anyone and was generous to the extreme. He delighted in plant collecting and was in the midst of planning new voyages of discovery when he was suddenly taken on January 22. He will be sorely missed by all those who knew him personally as well as by the plant world in general. His daughter is maintaining his nursery. Mr. Hodgson was the dean of bromeliad growers in Australia, as it was he who popularized the plants in his native land. At one time he had the largest collection in Australia, and he worked hard to build up collections in various parts of the country, especially in the botanic garden where he worked. 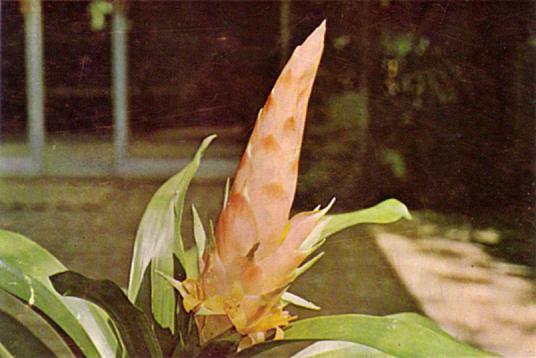 He was one of the original trustees of the Bromeliad Society, but was forced to resign because of age in 1962. However, he retained his interest in bromeliads, writing for local magazines and sending articles and photographs to the Society. DO YOUR BROMELIADS GET ENOUGH EXERCISE? I feel that a periodic look at my growing conditions and a comparison with the natural environment is always helpful in growing better plants. To make this comparison, I refresh my mind on the changes that take place in the natural environment and then analyze conditions as they exist for my own plants. 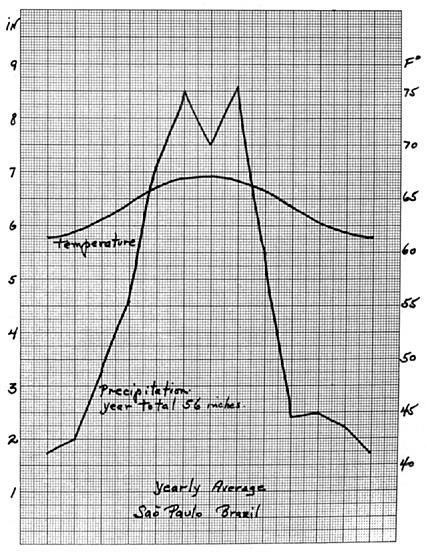 Figure I is a plot of average temperature and precipitation for a one-year period over the Amazon Plain. This is an enervating climate with only a 2½ degree change in average temperature from the coldest to the warmest month, and a very brief dry period. Daily temperature changes amount to about 12 degrees. Most of the other environmental factors are quite constant — always a gentle movement of air, never high velocity wind. Very few bromeliads are found in this relatively stable environment. Figure II is a plot of average temperature and precipitation for a one-year period over the Sao Paulo, Brazil area. A somewhat greater change of environments takes place in this area. 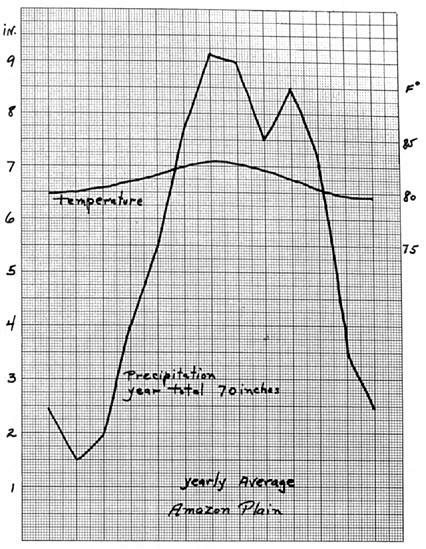 The most important differences between this and the Amazon Plain is the greater daily change in temperature which amounts to an average of about 18 degrees, a rather brisk movement of air, and a more definite dry period. The Amazon Plain area has only about a two-month dry period compared to four-and-a-half months at Sao Paulo. This area is very rich in bromeliads. Figure III is a plot of temperature range for a one-year period in the Teresopolis, Rio de Janeiro area. Figure IV is the same plot in the Los Angeles area. The mean isn't enough different to make any decisive difference in growth. The difference between the maximum and minimum averages however, in the Teresopolis area, is about 10 degrees compared to a range of about 25 degrees in the Los Angeles area. Very exact data are available for hours of darkness. Figure V is a plot of this information at Los Angeles. 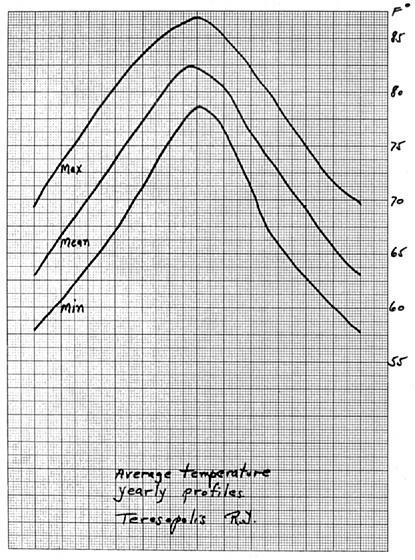 No exact data are available for humidity plots; but it is known that it is uniformly high in the Amazon Plain area, ranging to a low of 40% in the Teresopolis area, and to an occasional 10% in the Los Angeles area. The first five charts are average yearly changes. These have to do with triggering growth and bloom periods. The daily changes are more important in developing tough, healthy plants with vigorous growth characteristics capable of producing large, healthy bloom spikes. The optimum amount of change will vary considerably for different plants. The tough ones that are able to adapt, for instance, from an average 15° daily change in temperature to 25° may grow into perfect plants. On the other hand, a plant will not thrive if it is subjected to changes beyond its limits. Many of the soft-leaved plants thrive in areas where temperatures fluctuate through wide extremes if they are protected from high velocity wind. 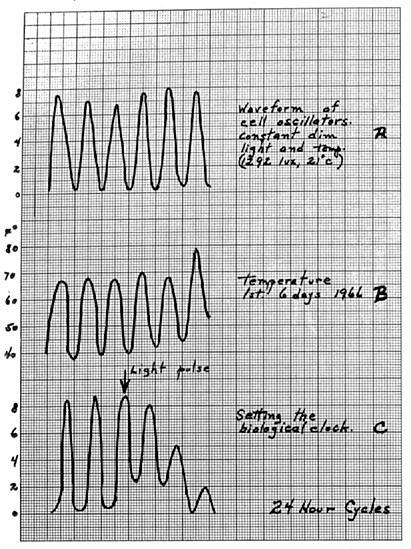 Figure VI-B is a plot of temperature changes the first six days of 1966 it my location. The A and C portions of this figure are included as an example of the extensive work that is going on in plant research. These figures are a result of cell chemistry investigation. Very sensitive instruments are required to observe these waveforms. 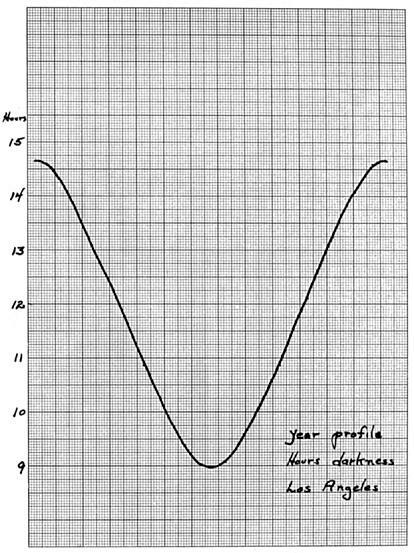 It is interesting to note that at a constant temperature and a low level of illumination maintained continuously without periodic light and dark periods, the cell under observation oscillates through a complete cycle every 24 hours. These waveforms can be altered by variations in chemical concentrations or other stimuli, such as a flash of light. This work is giving researchers an insight into the basic mechanism involved in setting the biological clock. These triggering mechanisms are responsible for the initiation of growth and bloom periods. It is well known that singly or in combinations, variations in temperatures, precipitation, light, darkness and humidity trigger these growth and bloom periods. For plants growing outdoors, environments can be modified to some extent. Wind velocity and light intensity can be modified with some form of lath house. Humidity can be increased when necessary by wetting down the walks, and periodic sprinkling. For plants grown in a glass house, environments can be controlled to any extent desired, limited only by one's pocketbook. Yearly programming of environmental changes can be accomplished by manual manipulation, performing the usual tasks — as the days lengthen and daytime temperature rises, increase air circulation, step up frequency of watering and provide plenty of humidity during the warm days. Daily programming of environmental changes can be accomplished with much more regularity by automatic control. The cost of such a control system is very small compared to the cost of the glass house itself, and it pays off handsomely in terms of better grown plants. My own thoughts for each of these controls are summarized in the following manner. My 2800 cubic foot glass house is easy enough to water manually, and this provides an enjoyable task and an automatic check of each plant. Automatic heating is provided to assure a twenty-degree change each day from about 57° F at night to 77° F at noon. Summer temperatures are somewhat higher. In my location, cooling is not necessary. Automatic control of humidity is provided. A simple humidistat turns on mist nozzles under the benches when the humidity drops below 50%. It is normally much higher than this, but in my location an occasional very dry breeze (called a Santa Ana) drops the humidity to about 10%, and if I'm away from the house some of the plants would suffer if I did not have a humidistat to stand watch. I have not found it necessary to install dehumidifying equipment. During the cool months, nights and early mornings are frequently foggy and the humidity goes up to 100%. When this happens, the thermostat is set to 85° F which dries the house down to about 65%. Some of the literature that I have read indicates that humidity should be maintained between 60% and 75%. My experience leads me to believe that most Bromeliads like a wider daily change. By heating or misting, if I can swing humidity from 85% or 90% in the morning down to 40% at the end of the day, my plants do much better than they do with a more constant level. Water conditioning is not provided. There is a need for such equipment in my location, and also in much of the Los Angeles area. The maintenance cost of such an installation at present is prohibitive for anyone with a limited budget. The need is becoming critical, and because of this a number of companies are developing low-cost equipment suitable for home and glass house use. This equipment should be available in the near future. Air circulation is provided by means of fans. My fans are the best investment I have. They materially aid in temperature and humidity changes to assure enough exercise for my bromeliads. Several years ago I engaged a professional entomological and insecticide company to spray a greenhouse containing mostly bromeliads. A few weeks later many of them had begun to quill. The tightness of the quilling was such that the plants were deformed and no amount of force could open the quills without tearing the leaves. These plants were destroyed. At that time the technique suggested by Mr. E. W. Ensign and described by Mr. Roger K. Taylor in Volume XIX, Jan.-Feb. Bulletin, No. 1, of soaking the plants for 24 hours in water to loosen the quills was unknown to me. However, I would say that it probably would not have worked because when trying to unquill the plants no evidence of stickiness or of adhesions was seen. I blame the chemicals in the spray. As an improvised mixture of different pesticides had been used in the spray, I could not identify the one that caused the quilling. Since this experience there has been practically no quilling in this greenhouse, and for what matter, no spraying either. Fig. 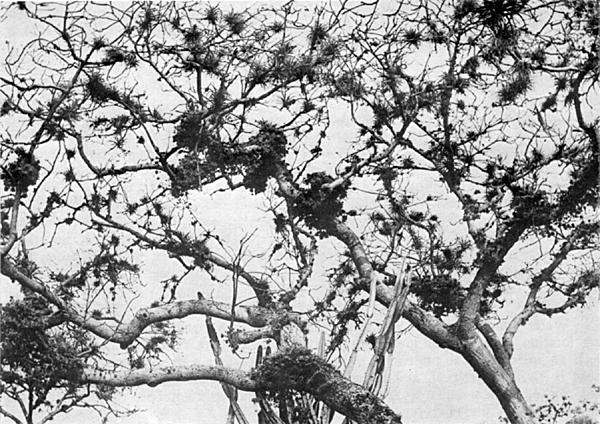 1 A Bombax tree covered with masses of Tillandsia ebracteata and Vriesea espinosae. 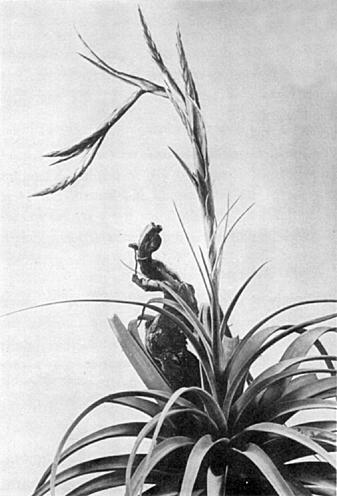 According to Dr. Lyman B. Smith it is impossible to distinguish a Tillandsia from a Vriesea in its vegetative state. The only difference between the two genera consists in the structure of the flowers. In Tillandsia the petals are eligulate, whereas in Vriesea they are ligulate, which means that the petals bear scales at their base which prevent the flowing out of nectar. Indeed, it is only a small difference and ought not be discussed in this paper if this difference did not justify the definition of the two separate genera. There are many "green" Tillandsias which look (without flowers) like Vrieseas, as well as there are "gray, atmospheric" Vrieseas, which resemble Tillandsias. The species name of Vriesea tillandsioides expresses the resemblance of Tillandsias and Vrieseas. Abounding in Tillandsia-like Vrieseas are the xerophytic forests of northern Peru and southern Ecuador. At an altitude of 800 to 1500 meters the leafless crowns of the trees are covered with such a lot of epiphytic bromeliads (Figure 1) that one has the impression of a densely covered leafy roof. Tillandsias and Vrieseas grow here in great masses, but you cannot distinguish the Tillandsias from the Vrieseas, for all the plants have gray to white, densely lepidote leaves. This sign is indicative of the high humidity at night, although the mean annual rainfall is negligible. Thus, the type of cistern bromeliads which store water in their leaf funnels is practically not represented here. Fig. 2 Tillandsia ebracteata growing on the cactus Espostoa lanta in North Peru, near Paima, elevation—1400 m.
The most frequent species of gray epiphytic bromeliads in these deciduous dry forests are the following: Tillandsia ebracteata (which grows also on cacti, on Espostoa lanata for example (see Figure 2), T. disticha, T. juncea, T. floribunda, T. recurvata, T. capillaris, T. usneoides, Vriesea espinosae, V. cereicola, V. rauhii, V. cylindrica, V. harmsiana, V. tillandsioides, V. olmosana, V. patula, and many other species. All cited Vrieseas look like Tillandsias and they can be distinguished from them only by their flowers. This species was discovered by the author in 1954 in Peru, in the valley near the small village Olmos and was described by L. B. Smith (Holotype Rauh P. 333). Vriesea olmosana grows as a stemless rosette of 50-70 cm diameter. The numerous leaves consist of long narrow triangular, densely gray lepidote blades of a length up to 60 cm; they are up to 4, 5 cm broad above the leather-brown, elliptic sheaths. These are up to 10 cm long and up to 7 cm broad. 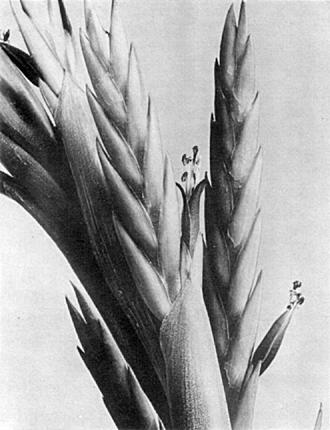 From the middle of the rosette rises the inflorescence, almost 60 cm long, whose axis is curved only in its upper part (Figure 3) or is entirely pendant. The inflorescence scape has a length of about 30 cm and is densely covered with scape-bracts. The lower ones are leaflike; the upper ones have a long narrow blade. The inflorescence is compound of 10-15 erect or nearly erect spikes; these have a length of about 15 cm, and they produce 10-12 flowers each. The primary bracts are broad-oval, green to red and lepidote at their tips. The flower bracts are densely imbricate, sharp keeled on the back, up to 2,5 cm long, pale green at their base and bright red in the upper part. The flowers are up to 2,5 long and are dark violet. The petals are white margined. Stamens and style exceed the petals. —Institute fur Systematische Botanik der Universitat, Heidelberg. Most of the news seems to come from California these days. Outstanding was the March meeting of the Bromeliad Guild of Los Angeles, which was in the form of a luncheon held in the memory of James N. Giridlian, who had been one of its most respected and beloved members. Seventy members were present. Films of some of Mr. Giridlian's plant exploration trips to Mexico were featured. The guest of honor was his daughter, Alice Giridlian Gans, who is carrying on the work of her father. The San Diego Bromeliad Society is working hard to advertise bromeliads in that area, entering bromeliad exhibits at practically every flower show in the county and carrying away all the honors. The program chairman, Mrs. T. M. O'Reilly, has started a club project testing the effect of light on bromeliads — each member of the society being given a bromeliad to grow under various light conditions. At the end of three months, the differences in the growth and coloring will be discussed and written up (we hope) for the Bulletin. 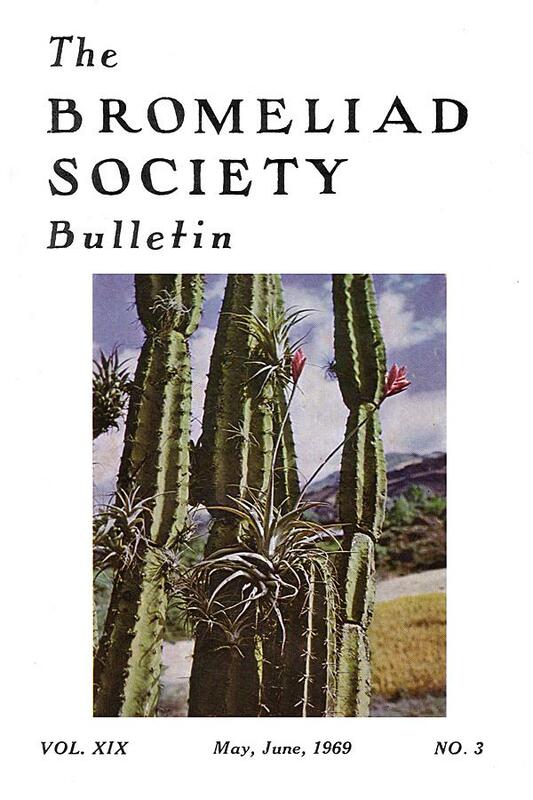 The South Bay Bromeliad Associates, with headquarters in Palos Verdes, California, is to be congratulated for their fine bulletin, issued under the able editorship of R. W. Spencer. Dr. G. F. Quiros is to be commended for his Etymologicon of Bromeliads, a dictionary of bromeliad names with their meanings, compiled for the members of the Associates. Such a listing is of great help to the grower as a name often tells one much about the characteristics of a plant. It is always a pleasure to receive the bromeliad "News and Views" issued monthly by the Bromeliad Society of New Zealand — Mrs. F. B. Hanson, editor. A chatty little paper, it is not only full of interesting news about the society and its activities, but describes many of the members' gardens and collections, as well as giving many cultural hints. I never cease to wonder at the great number of unusual bromeliads which are displayed at the meetings. Many of these plants are practically unknown in the United States, or are so rare as to be coveted collector's items. Although New Zealand for many of us lies at the end of the world, it certainly is in the midst of fine bromeliad growing. Also to be congratulated for the excellence of their publication is The British Bromeliad Society, A. J. S. McMillan of Bristol being the editor of the Journal. The articles are all geared to the beginning grower, who has to raise his bromeliads, for the most part, under adverse conditions. Britain is not the ideal spot for raising plants that want light and heat and warmth, but the English seem to be well on their way to overcoming such obstacles. In each issue is a beautiful colored photograph — in the last issue Guzmania minor flammea was featured. All affiliated groups are urged to send any interesting news about their activities to the editor, so that they may be printed in the Bulletin. The common English word color is taken letter for letter from the Latin and is used with its Latin meaning. It is used as a stem in such words as bicolor, tricolor, discolor, and concolor. When discolor is used as a species name, it has its Latin original meaning, and not the meaning it now has in English. In bromeliad nomenclature it is used to indicate two contrasting colors, particularly a different color on the back of a leaf from that on the top. Concolor means "of, or with the same color" and also may refer to the coloration on the top and bottom side of the leaf. We find this word, for instance, as the species name of Tillandsia concolor. In Latin the first o of color is short, and therefore in the words bicolor, tricolor, and discolor the accent (as in English) is on the third last syllable. In classical Latin the i in bicolor is short, and this brings us to an interesting point. In English and in the English pronunciation of Latin we say bī-color making the i long. It seems to be more "adequate" to us generally to pronounce the short vowel of the third last syllable long, if the vowel terminates the syllable. Another example is syriacus (meaning Syrian) when we say syrī ácus, although in the classical Latin it was pronounced with a short i. Many species names are descriptive, and many of these descriptive names consist of two stems joined together. In Latin the connecting particle is the letter i. For example, brevifolia and rariflora. This particle i is never long — in the examples above and others, the i is pronounced as the i in hit. The joining particle that is used usually in Greek compounds is the letter o, and this will help us to distinguish between words of Latin and Greek origin. Examples of such compound words used as species names are gamosepala and macrolepis. Here again, the connective o does not take on a full long sound. Since the e in macrolepis is short, the accent goes over to the o which makes the pronunciation macrŏ lĕpis. The pineapple family consists of three subfamilies. When a plant family has groups within it that have sufficiently strongly differing characters between them, the groups are classed as subfamilies. Each subfamily is based, just as the family was, on a selected genus. To designate a subfamily, the suffix -oideae is added to that selected genus. The suffix is pronounced oy' dee-ee. The subfamily Bromelioideae (bromeeleeoy'dee-ee includes the genus Bromelia and those most related to it. The subfamily Tillandsioideae includes Tillandsia and the other spineless-leaved epiphytes. In Pitcairnioideae are Pitcairnia and such dry-area genera as Puya, Hechtia, and Dyckia — these latter genera also sought by collectors of succulents. Aechmea eek-me'a (The incorrect pronunciation with the accent on the first syllable is found in some works, but in the Greek stem aechme (= a point) the final e is the long Greek e. Therefore, the syllable me is by necessity long, and must be accented. Ananas anay' nas is strictly correct, but ananas pronounced like the word bananas is permissible. Greig was a Russian botanist. The most satisfactory pronunciation seems to give it the Russian value of ei. NOTE: As will be seen from the above names of genera in the family slightly more than half are commemorative names in a variety of languages. Also, in Ananas and Puya, we have local native names. Therefore, less than half are of the typical Latinized kinds, rules of pronunciation may be simply applied. With the others it is often difficult to come to an acceptable conclusion. It is the side shoot or pup that carries the life of the mother-plant into the future. To a certain extent the mother-plant even foments development of the pups and their growth. Compared to reproduction by seed the off-shoot process is by far the shorter and more rapid means of reproduction. Although the roots of the off-shoots appear comparatively soon, it is always wise to leave them on the old plant as long as possible. Removing the pup too soon is of no advantage to the pup; it interferes with its development and does not benefit the mother-plant in any way. We can distinguish two different ways of pup formation. The majority of bromeliads have the pups very close to the old plant. They sprout directly from the much compacted mainstem. As they develop, they tend to crowd the mother plant so that it gets crushed and dies after seeds have matured. At this point pups are often ready to bloom. In cultivation we interrupt the natural cycle, detaching the off-shoots when they have three to six leaves of their own. With a sharp knife slice the shoot off close to the old stem using a downward movement and draw it away sideways. Be careful not to injure new roots if they are present. A cut too close to the soft part of the new shoot may kill it. No pampering, not even drying it for a few days, will revive it. The expedient would be to no avail, especially if rootlets are present. Their tender points would dry and lose their ability to function. It is most difficult to make a perfect cut in very small, that is very young, offshoots. For this reason alone it is unwise to carry out the operation too soon. Some species of bromeliads have a different style of pup formation. The new shoot quickly outgrows the mother-plant in height, or in width sideways over the trim. The pup forms on the end of a rapidly hardening stem. A clean cut with a pair of garden shears, or with a strong knife, through the stem disconnects the pup from the old plant. Enough of the woody part of the stem that will not issue roots should be cut off; rootlets or signs that they are about to sprout can often be detected near the base of the pup. That part should never be severed. In doubt it is better to leave a little more of the woody section than to cut off too much. The condition of the old plant after the pups have been removed can be the determining factor whether the plant should be thrown out or kept to see if additional pups will form. As said before, only a limited number of side shoots are produced. Vriesea splendens and its hybrids have the new shoots arising directly along the mother-plant's spike. As the new funnel develops, it presses the old spike out of place. It would be impossible to detach the old spike and it is not necessary because only one, rarely two, offshoots appear and develop into independent new plants without outside help. Intervention would most likely endanger the plants. The huge Vriesea imperialis and Vriesea reginae have a ring of new plantlets encircling the base of the growing older plant early in life long before maturity. They can be easily taken away because they are only loosely connected with the old trunk and should be treated as seedlings. Another form of pup production can be seen in Cryptanthus. In most of the species the young plants develop in the axils of the mother plant's close-set leaves. As they grow they make their way out of the axil and become independent. Some species, as Cryptanthus zonatus, which produces only a few pups, develop in addition stolons that set root fast and are a sure guarantee of perpetuation, at least in nature. The dismembered pups should be planted into comparatively small pots. The small pot makes roots grow sooner and in turn favors growth of the plant. As a precaution the cuts may be dusted with charcoal, especially where tissue has been injured. The pups should not be planted too deep; otherwise they might rot. On the other hand, if they are not planted deep enough, they will become unstable — a situation which will deter root formation. For this reason it is necessary to compact the potting mix around the young plants. The point of using a porous mix is to coax roots to form soon. This is important especially for the epiphytic species. I use a mix of ground peat, pine-needle soil, half-rotted leaves, and sand. In the case of extra valuable species the porosity can be increased by adding a little chopped sphagnum and cracked brick. The newly planted pups should be placed in a warm glass house. For plantlets belonging to Group I, a temperature of 18-20° C is enough in sufficient shade. Plants of Group II, such as Vrieseas and Guzmanias, appreciate warmth, and the temperature for them may be as high as 22-25° C or more. The funnels should get water at once, but the potting mixture needs only a spraying that will keep it moderately moist to the touch. The condition described should be maintained during the first weeks until roots are formed; generally it does not take long. If the mix happened to get very dry, good root growth may be impeded, but too much moisture, on the other hand, may induce rotting or give rise to other complications. The grower handling small lots will of course want to keep his seedlings of both groups in the same compartment, but he should remember the extra requirement of Group II and give it more warmth and shade. During the first period no bad effects on the species that require less warmth and more light need to be feared. But as roots increase, development factors become active, and it is well to think of segregation, at least by giving the brightest location in the house to the hardier kinds that need more light. Plants raised from offshoots can be easily distinguished from seedlings. They are a little higher and have fewer leaves, of which more are larger than smaller. Gradually increasing leaf size, a greater number of leaves, and these harmoniously disposed — these are the marks of seedlings. Correct care keeps all leaves alive until adulthood. No additional distinctions can be noticed. There is no change in the flowering period. Maturity can be gauged by the development of the single plant. If a single plant is weak, another year of care is required before it will bloom when its season comes. In practice this means that it makes no difference at which time of year the pup was detached from its mother plant and that vegetative reproduction may be carried out the year round. One may avoid doing it during the darkest months in our latitudes, November and December, but it is not a necessity. By the way, it is not essential that pups be removed from the old plants. They may be left on if an exhibit of a many-funneled plant is desired. Especially Neoregelias with broad, short leaves lend themselves for this purpose. The slender Billbergias and Aechmeas can become eye-catching specimens. Less pleasing are the bromeliads with close narrow-leafed rosettes; their blades overlaps and the specimen lacks rhythm. When an opportunity arose last year for me to go overseas, I planned to take in some bromeliad viewing in the U.S.A. and to learn more about these plants from Bromeliad Society members. What I was not prepared for was that I would see bromeliads on nearly every day of my 'round the globe' journey — my first trip out of Africa. In Athens, with barely 24 hours between flights, I saw dozens of Aechmea fasciata in a florist shop displayed among potted camellias with the largest blooms I had ever seen. This breath-taking sight was in sharp contrast to the dull, cold, and drizzly day. The first artificial bromeliads of my tour were seen in Madrid. Neoregelia carolinae var. tricolor and Aechmea fasciata in an indoor windowbox caught my eye, and it was only at close range that I realized that the plants were artificial. The copies were good, but they lacked lustre. I do not like these artificials which are sweeping the world just now, but that is a personal matter. After a fortnight, in southern Spain, I flew to Miami, where I visited the Parrot Jungle. Bromeliads massed along the walks grew in beds mulched with wood chips and were obviously growing happily. Of particular interest was Guzmania lingulata var. splendens, which at maturity seemed almost twice the size of mine. There were a good variety of plants to hold one's interest. Imagine the delight of seeing Phalaenopsis hovering over the pools in just the way we arrange them at our orchid shows, though we have to grow the plants in heated houses. My flight to Tampa was cancelled to enable me to take a bus across the country to enjoy the landscape. Mr. Wurthmann had informed me to look out for Tillandsia fasciculata on the way. Seeing these red torches clinging to the sparsely branched trees festooned with Tillandsia usneoides was a pleasant surprise. I arrived to find a meeting of the Tampa Bromeliad Guild in progress, the center of interest being some members' haul from the Alligator Alley region. Tillandsia pruinosa was among the find and various other specimens were shown which were new to me. What a pity my time was so limited, as I would have enjoyed accepting the invitations from this hospitable group to see their collections. However, I soon found my hotel booking cancelled, and the next week I was the guest of Velva and Ervin Wurthmann, who took me under their wing. We visited Mr. Mulford Foster's Cathedral — I can't think of any other way of describing my first impression and hope it does not offend. The atmosphere had an innate feeling of peace and tranquility. The live Oaks were dripping with grey 'stalactites' formed by Spanish Moss, and the floor was massed with bromeliads, palms, cycads, and other choice items. Much in evidence at Bromel-la as a ground planting was Neoregelia marmorata with its maroon mottling on lime green leaves tipped red. Another Neoregelia was N. × 'Marcon' (N. marmorata × spectabilis). Ananas bracteata was in fruit and so was A. nana with small pink fruit. These pineapples were so delightful that I think they are a must. As Mr. Foster is the originator Aechmea × 'Foster's Favorite,' I was bound to see it here. The smoothy satiny leaves of soft beige and burgundy are very beautiful. Cryptanthus 'It' is another bright little plant, which I have acquired since, much to my delight and my friends' admiration. Another plant of note was Neoregelia fosteriana. I made note of several Dyckias which look more as if they should be classed with aloes than the pineapple family — D. frigida — semi-large, D. maritima — lovely orange, altissima — tall yellow, leptostachya — yellow, and brevifolia. Aechmea distichantha var. schlumbergeri, a large plant with handsome pink flower spike, was in bloom. Mr. Foster had a new hybrid Vriesea to show, but not to part with — frustrating to an avid collector such as Mr. Wurthmann. The time went all too soon, but we wanted to call on Mr. Julian Nally, who is the owner of a lovely old home with wood-paneled walls set amongst a thicket of tall trees, the ideal retreat for someone desiring to get away from the turmoil of city life. Mr. Nally has many hundreds of Vriesea × Mariae planted out in situ. A break-through was a new hybrid with a bright pink-lilac on the leaves. On our return to Tampa, Mr. Wurthmann had a telephone call from Mr. Ralph Davis who told him of my disappointment at not seeing the Everglades, so it was arranged that I could go. We traveled along the West Coast, and at Alligator Alley we searched for Tillandsia pruinosa — so I had an opportunity to collect plants from the wild. With the poison ivy, snakes, the oppressive heat and humidity, any longing for a plant hunt into parts of the Amazon Basin disappeared. Nevertheless, despite the moans, I enjoyed the experience. We arrived in Miami to find Mr. Davis in good spirits, though he was not enjoying the best of health. The most memorable visual sights here were the large groups of Aechmea Marie Reginae in bloom and Mr. Davis' famous crotons. On the way back to Tampa we visited various nurseries, the size of which I found to be bewildering. I then had the chance to see the Wurthmanns' outstanding plants. After seeing me off for New Orleans, my host and hostess could once again settle down to routine — my first sample of overwhelming American hospitality. New Orleans captured my senses. Its Spring Fiesta was still in progress, so I had the opportunity to get a special insight into the life and history of the community. I had the pleasure of seeing the home of Mrs. Charles Brown, past president of the Louisiana Bromeliad Society, who very kindly took me to visit Mrs. Wisdom, the present president. Apart from her plants I enjoyed seeing several of the bromeliad drawings by the late Mr. Morris Hobbs. A delightful trip took us to the century-old plantation home of Mr. and Mrs. Eric Knoblock. No more charming or romantic place can be imagined. The garden was beautifully landscaped with the added luxury of the Mississippi River acting as boundary barely fifty yards from the homestead. I came away with numerous packets of seed, which have since germinated to keep alive a memorable afternoon. The last of the Bromeliad Society I met was Mr. Jack Roth, our treasurer. Unfortunately it was a rainy day in Southern California, so much of the beauty of the Hollywood Hills was lost, but I was able to see Mr. Roth's well-constructed greenhouse filled with many bromeliads and orchids including the miniature cymbidiums, which are gaining in popularity. I cannot end this paper without mentioning the many beautiful bromeliads seen in Japan. The revolving restaurant of the Otani Hotel in Tokyo featured magnificent displays of brilliant Neoregelia carolinae var. tricolor and Aechmea fasciata en masse, which is a striking way of using bromeliads. During my stay in Japan I studied Ikebana, the Japanese term for flowering arranging. For my lessons in flower arranging I had to buy my flowers in a little florist shop which received fresh supplies of bromeliads every day. The shopkeeper realized the potential of the flower spikes in their arrangements and made good use of them. The potted plants were incredibly cheap to buy — those I saw were grown in osmunda fibre. While in Hong Kong I saw a few bromeliads in a large orchid collection, but here the main interest is obviously orchids. During my absence my plants had not suffered at all and no one seemed to have missed me; everything went swimmingly, so it just goes to show that we housewives are not indispensable after all. When I walked into my home, there were plants everywhere, and a special copper container had been brought in to make an arrangement of my many favorites. This highly attractive Guzmania was collected in the mountains of Puerto Rico. It is also to be found growing in the rain forests of Cuba and Jamaica, where it is not too common. There appear to be two varieties of Guzmania erythrolepis as noted by this writer: one, as shown in the picture above, has lettuce-colored foliage and a pale inflorescence and yellow flowers; the other has maroon-colored leaves and a flower head that is a deeper orange and flowers that are white. Otherwise, both plants are similar. They are medium sized, have the same cone-shaped inflorescence, and flowers first appearing around the base and gradually working their way upwards. The foliage is soft and leathery. It is surprising that this bromeliad is not more often seen in cultivation, as it is highly attractive, but many plants growing in the West Indies are still collector's items and difficult to obtain (Aechmea dichlamydea, Ae. serrata, Vriesea sintenissii, for example). The writer has found this plant does best in the shady, damp section of her greenhouse. The plant is rather reluctant to produce many pups, not more than two or three, and is rather temperamental. Perhaps, it would do better under other growing conditions. For a complete description of Guzmania erythrolepis, see L. B. Smith, North American Flora, Volume XIX, Part 2, Page 185.